Which T-Mobile smartphones will support LTE? After a long wait, the next crop of Windows Phone handsets are beginning to trickle in, and just in time for the holidays. If you're familiar with our reviews of the HTC 8X and Nokia Lumia 920, you already know that Windows Phone has some impressive contenders in its stable, but these flagship devices only tell half of the story. Now, we're given an opportunity to test the Lumia 810, a mid-range smartphone that's now available on T-Mobile. It's clear that T-Mobile isn't looking to start a price war here. At $150 after a rebate, the Lumia 810 costs more than Nokia's crown jewel, the Lumia 920, which you can find on AT&T for $100. Another telling sign: the phone also costs more than its siblings, the Lumia 820 for AT&T ($50) and the Lumia 822 for Verizon ($100). Naturally, you'll be able to recoup some of this with T-Mobile's lower monthly fees, but it goes without saying that T-Mobile is levying an early adopter tax on its subscribers. That said, for those sold on Windows Phone yet unwilling to jump ship, you're left to choose between the Lumia 810 and the more expensive HTC 8X. Along with its lower cost, Nokia holds an ace up its sleeve in the form of its home-brewed Windows Phone apps, which may be enough to sway customers away from HTC's flagship. Will the extra card be enough for a winning hand? Join us after the break as we explore the finer points of the Lumia 810. 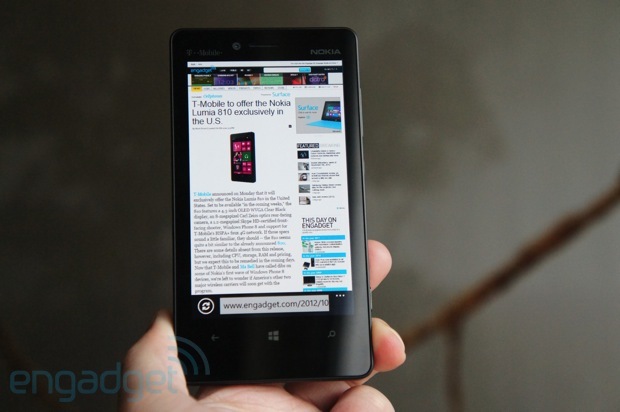 The Lumia 810 is a well-rounded smartphone, but it can't compete with the more aggressively-priced Lumia 920. 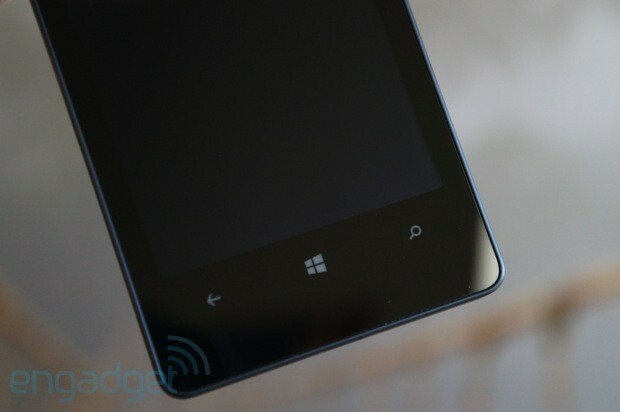 How would you rate the Lumia 810? If you like substantial handsets, you're going to dig the Lumia 810. For others, its shape may be a bit of a sticking point, as it's one of the chunkier smartphones we've come across in quite some time. 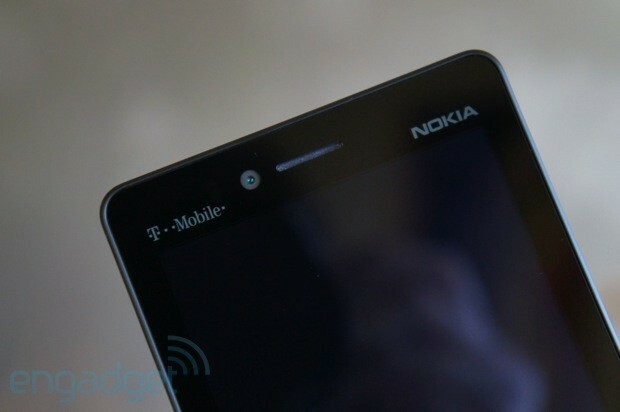 Despite the relatively common 4.3-inch display size, Nokia's latest creation for T-Mobile is surprisingly large. To put things in perspective, the phone nearly matches the height and width of the HTC One X, and yet at 0.43 inch (10.9mm) deep, it's also quite a bit thicker. If you'd prefer a more compact Windows Phone, look to the HTC 8X instead, which is easily the more svelte of the two, despite the similar dimensions. Beyond its physical dimensions, the Lumia 810's substantial appearance is reinforced by its aesthetic design. Unlike most smartphones, which attempt to disguise their girth with curved or beveled edges, the Lumia 810 flaunts its thickness with clean edges and flat sides that are fused with the tapered rear casing. Overall, the handset is very comfortable to hold, and more importantly, it's easy to operate with one hand. You might notice, however, that it's a bit more difficult to slip into your pocket, given that thick profile. The Lumia 810 is a spiritual successor to the Lumia 800 and, when it comes to T-Mobile's offerings, the Lumia 710. 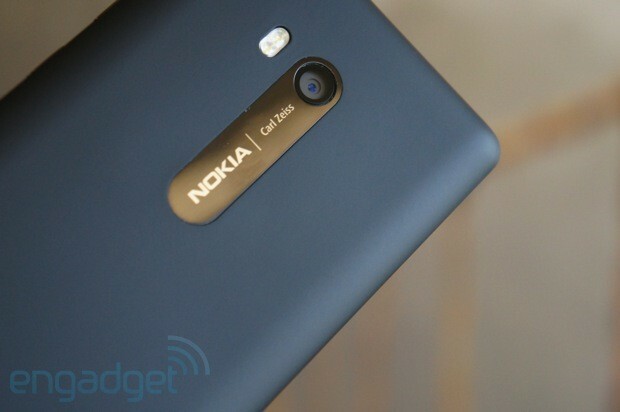 From a design standpoint, however, it represents a fresh start for Nokia. Unsurprisingly, the phone has similar proportions as the Lumia 820 for AT&T and the Lumia 822 for Verizon. Still, without rounded sides or corners, the Lumia 810 is the most elegant of the bunch. The face of the phone is also spare: it's just a solid, expansive sheet of glass. It houses the front-facing 1.2-megapixel camera, ambient light and proximity sensors, an earpiece and the capacitive Windows Phone navigation buttons. Absent from the equation is a notification light, which is a distinct advantage of the HTC 8X. Situated in the middle of it all, of course, is that 4.3-inch, 800 x 480 (WVGA) ClearBlack AMOLED display. Unique to Nokia, the screen features a polarized filter that makes it easier to view content in direct sunlight, and in this regard, it really is a step above the competition. As another differentiator, it's also possible to manipulate the screen with your fingernails or even while wearing gloves. Yes, bare fingers are still ideal, but the utility here is hard to ignore. Overall, the display offers plenty of real estate for content, vibrant colors, deep blacks and superb viewing angles. There are a few downsides, however, as text appears surprisingly jagged within the web browser and the display's white balance is decidedly on the cool end of the spectrum. 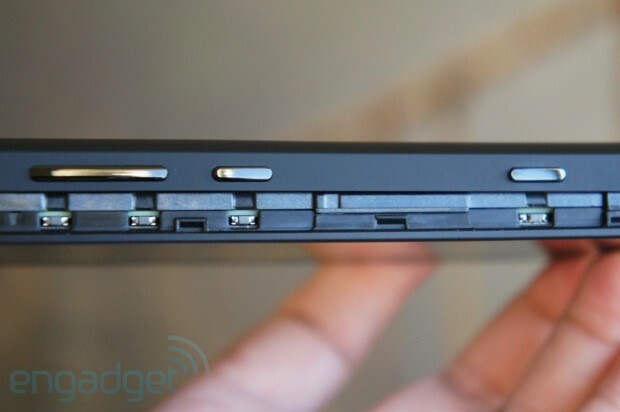 The rear cover of the Lumia 810 is, in fact, a complete shell that wraps around the sides of the device. As such, it also contains the volume rocker, power button and dual-stage camera shutter button, which are located on the right side of the shell. As a bit of good news, right-handed folks should have no trouble cranking up the volume or waking the device, as both buttons are within thumb's reach. On the bottom, you'll find a micro-USB port that's situated between two grilles, which conceal the loudspeaker on the left and the primary microphone on the right. 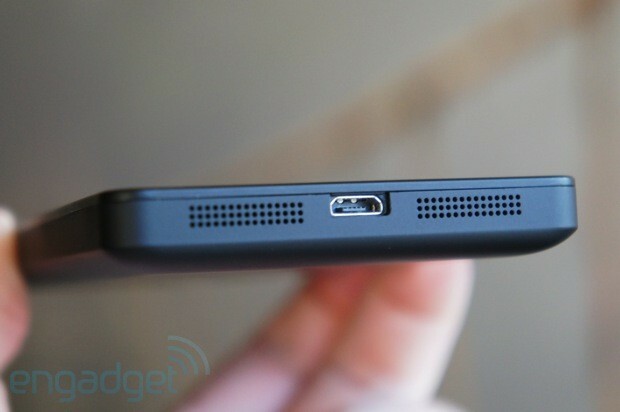 Up top, you'll find a 3.5mm stereo headphone jack and an additional microphone for recording stereo sound. The phone's rear is quite spartan, containing a vertical camera pod -- complete with Nokia and Carl Zeiss badging -- along with a dual-LED flash. As a nod to those who easily get bored, the rear cover is completely interchangeable, and purchasers may choose between shells with different colors and textures, along with ones that support Qi wireless charging. 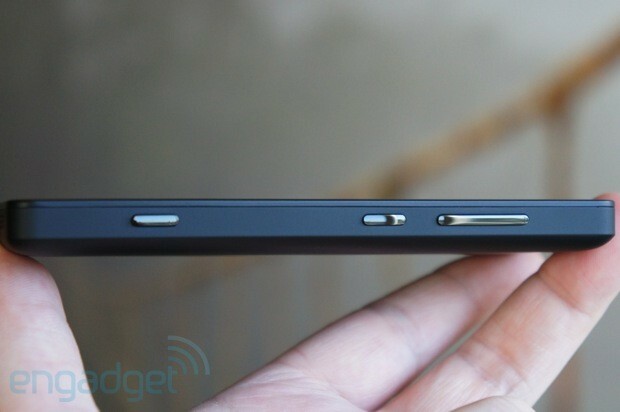 For the most part, the Lumia 810's thickness is a differentiator, rather than a hindrance. It's also somewhat necessary, as the phone offers built-in support for the Qi wireless charging standard, which means it's compatible with Nokia's charging pillow from Fatboy. Once the rear cover is removed, you'll find a removable 1,800mAh battery that occupies a substantial amount of space. 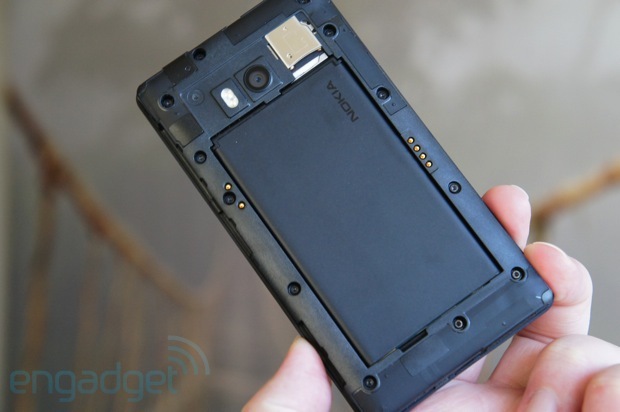 You'll also discover a micro-SIM tray and a microSD slot, along with an NFC antenna that's built into the rear shell. Beyond design, there are a few other differentiators between the Lumia 810, 820 and 822 versions. In terms of battery capacity, the Lumia 810 and 822 both sport 1,800mAh cells, whereas the 820 offers only a 1,650mAh option. It's a similar story for the front-facing cameras, as both T-Mobile and Verizon's phones are capable of capturing 1,280 x 960 imagery, while AT&T's version is limited to VGA quality. With respect to internal storage, Verizon's Lumia 822 takes the prize with 16GB built-in, whereas the Lumia 810 and 820 offer 8GB. This last consideration shouldn't be much of a deal-breaker, however, as all three phones accommodate up to 64GB of expandable storage. It's also worth mentioning that the HTC 8X doesn't have a microSD slot, which could be enough to make the Lumia 810 an easy choice for some T-Mobile shoppers. Nokia's inclusion of a Qualcomm Snapdragon S4 in the 810 isn't much of a surprise, as it's part of the current Windows Phone reference platform. We'll discuss performance in greater detail a bit later, but with a 1.5GHz dual-core Krait CPU and an Adreno 225 GPU, you can rest assured that the Lumia 810 offers nimble performance. Naturally, the Snapdragon S4 also offers up a wide array of connectivity options, which include DC-HSPA+ access over the 850, 1700, 1900 and 2100MHz bands, along with 802.11a/b/g/n and Bluetooth 3.0. For a more detailed breakdown, we've included a complete spec sheet for your perusal. It almost goes without saying that Windows Phone 8 and a Snapdragon S4 combine to offer excellent performance. As you might expect, benchmark scores place the Lumia 810 roughly in line with the Lumia 920 and HTC 8X, and real-world performance is every bit as solid. As is often the story for Windows Phone, many of the stock applications pop open nearly immediately, with the operating system's characteristic animations being the only delay. Nokia's own apps are also quite quick to load, although third-party titles such as Yelp and Weather Channel take a bit longer -- somewhere in the ballpark of two to three seconds. Internet Explorer 10 is usually quick to initially render pages, but complex sites sometimes require a decent amount of time to fully load. This would normally be a minor annoyance at most, but if you've become accustomed to panning and zooming through content as it's still loading, you're likely to experience stutters and longer-than-normal render times. So, despite the browser's excellent SunSpider benchmark scores, we're left with the impression that Internet Explorer needs a bit more polish to match the overall fluid experience of Chrome and Safari. In real-world use, the Lumia 810 is a generally competent performer, but there are areas where it still needs improvement. For example, while the camera app is quick to load, it generally takes three to four seconds to capture the first shot. Likewise, cold-booting takes somewhere in the 40-second range, which is about twice the time we've come to expect from modern smartphones. Perhaps its strongest point is that it grabs its GPS positioning from satellites nearly instantaneously. That's a nice touch, given the company's emphasis on location-aware apps. Those who demand excellent call quality can also rest at ease, as all of our calls were consistently clear and free of distortion. Likewise, those on the other end were similarly impressed with the clear call quality. As for battery life, we were easily able to squeeze more than two days out of the 810 with light to moderate usage, as the phone runs very efficiently in standby mode. In a more strenuous test -- which involved constantly snapping and uploading photos, messaging, browsing the web in sunlight and navigating throughout town -- the Lumia 810 chewed through half of its battery capacity after four hours. Meanwhile, the Lumia 810 survived for 2.5 hours in the WPBench battery torture test, which puts it directly on par with the Lumia 920 and HTC 8X. When it came time to juice up, we found that Nokia's micro-USB charger was able to take the battery from empty to full in two hours. From our experience, it generally takes longer to charge phones wirelessly, although we weren't able to test this with the Lumia 810. Nokia prides itself on stacking its phones with excellent camera hardware, but it also has a reputation for finicky setups that often require users to fine-tune the settings in order to capture the best possible shots. Fortunately, the 810's camera is on its best behavior; the phone is able to produce some impressive shots even in auto mode. The 810 combines an 8-megapixel sensor with a Carl Zeiss 26mm f/2.2 lens, which is accompanied by a dual-LED flash and a two-stage shutter button. By default, the camera is set to capture images at 16:9, though we generally prefer the optional 4:3 aspect ratio. When you choose to take a picture, the camera will activate the LED flash to help assist its focus, and from there, it takes a moment to lock in on the subject before snapping the actual shot. In this sense, the camera isn't the speediest, and its software offers no option for burst photography, but your patience will be rewarded with quality results. In all but the rarest cases, the Lumia 810 properly meters light and delivers accurate white balance. We're also particularly fond of the 810's tap-to-focus feature. Nighttime performance is generally adequate, but it pales in comparison to the low-light photography that's possible with the Lumia 920. We often found it necessary to stabilize the phone on a flat surface or rely on the flash -- otherwise, you risk capturing an unusable amount of blur. True photo junkies may cringe at the relatively limited options for fine-tuning photos, which is limited to ISO, EV, white balance and a selection of scene modes such as close-up, night, sports and backlight. Unfortunately, the interface also makes it difficult to preview the adjustments, as the options menu covers most of the screen. 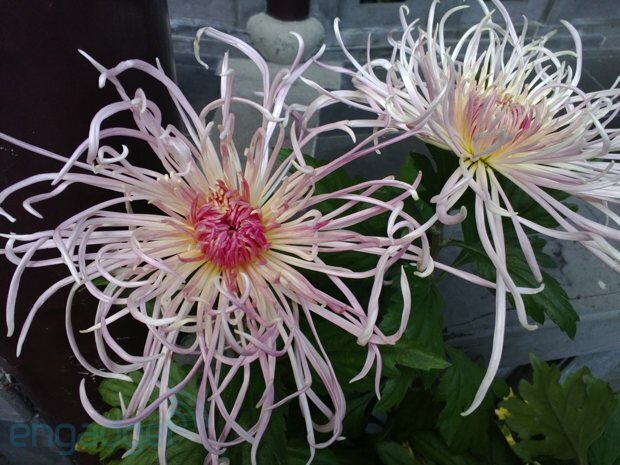 Nonetheless, the camera is very well-suited for casual photography, and users can further apply stylistic filters to their images with Nokia's Creative Studio app. Accessible from within the camera application, you'll also find shortcuts to Bing Vision, Cinemagraph, Panorama and Smart Shoot. Each of these apps are known within the Windows Phone ecosystem as Lenses, and you'll find the ability to install additional Lenses within the Windows Phone Store. You might already be familiar with Bing Vision, which allows users to capture QR codes and Microsoft Tags, and search for books, movies and albums by scanning the barcode or cover. Meanwhile, Cinemagraph is mostly for novelty sake -- it allows users to create moving images by recording brief scenes and then choosing specific areas of the scene to animate. The idea is to combine the quality of a still photo with the motion of a GIF, but as we quickly discovered during our review of the Lumia 920, the files are converted to a still JPG format when you attempt to share the animation via email, Twitter or Facebook. Needless to say, this oversight severely hinders Cinemagraph's appeal. Meanwhile, Panorama is a one-trick pony, but it's dead simple to use, and generally delivers excellent results. Out of all the Lenses, Smart Shoot is the most intriguing, as it incorporates features found in Scalado Rewind and Remove. Smart Shoot captures a series of images and then allows users to eliminate undesirable elements like cars or pedestrians. It's also quite handy for group shots, as you'll find the ability to choose the best faces from a handful of images and then combine them into the best possible photo. Smart Shoot is a bit finicky and still requires you to be on top of your game when taking pictures, but when it works properly, it's nothing short of magic. Video capture on the Lumia 810 is somewhat of a mixed bag. To the phone's credit, it records 1080p video with a high amount of detail and good audio quality that places an emphasis on minimizing background noise. Colors are generally accurate, although it's plain to see that the white balance shifts a few times during our short clip. This isn't nearly as distracting, however, as the overall jelly-like motion and jitters that are hard to avoid unless you're able to hold the phone perfectly still. Needless to say, the Lumia 810 lacks the fancy optical image stabilization technologies that you'll find in Lumia 920, and the difference is immediately apparent. 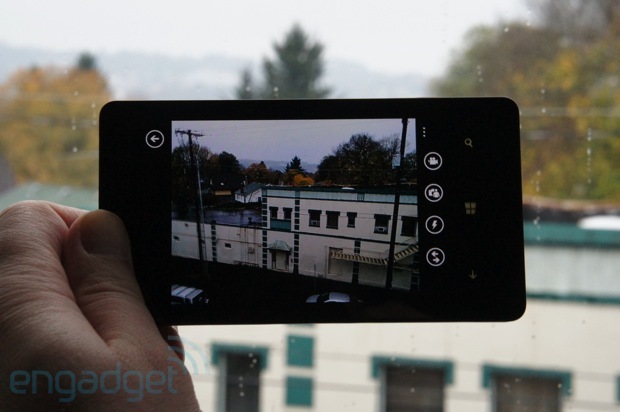 For comparison sake, we've included sample videos from both the Lumia 810 and 920. If you're unfamiliar with Windows Phone 8, we encourage you to read our full review, which delves into the benefits and drawbacks of Microsoft's latest mobile operating system. One particular sore point is its app ecosystem, as developers haven't rallied behind Windows Phone to the same extent as Android and iOS. Some of the official apps you won't find include Flipboard, Instagram, Meetup, MOG, Pandora, Pinterest, Redbox, Sonos, Spotify, Stitcher, TiVo and TuneIn. We hope to see this change in the near future, but for the moment, you may experience some growing pains of your own with Windows Phone 8. Unless you have a particular need for expandable storage, the HTC 8X is without a doubt the better Windows Phone on T-Mobile with respect to hardware. If you'll recall, however, we hinted at the beginning of this review that Nokia has loaded the Lumia 810 with its own assortment of useful apps, which may be enough to sway your decision in favor of the Nokia. We've already discussed some of these titles in the camera portion of our review, but you'll also find a number of location and navigation based apps, along with Nokia Music. First on deck is City Lens, which is Nokia's own version of Local Scout, but with a greater number of categories and an added augmented reality component. The app is fun and packs a certain "gee whiz" element, but it's also quite useful when you're looking to familiarize yourself with new surroundings. Oddly enough, City Lens demands that users calibrate the compass whenever loading the app, which is frustrating and seems a bit unnecessary. 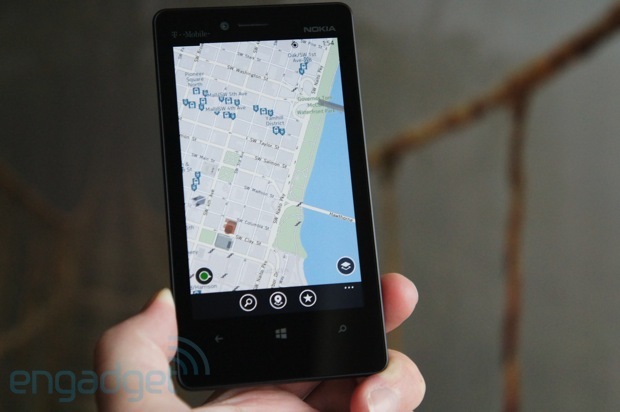 What's more, once you select a place of interest, you'll be kicked over to Nokia Maps, which takes a few seconds to load. Do this a few times and the wait times really begin to add up. As another frustrating point, Nokia Maps suffers from a lack of photos and reviews, which means that you'll probably need to turn to Foursquare or Yelp for genuine insight. City Lens shows a lot of promise, but it'll need a lot of polish to become a serious contender to other location-based discovery apps. While City Lens has a certain experimental feel to it, the Lumia 810 begins to shine with Nokia's navigation apps. Without mincing words, travelers and commuters alike should give serious consideration to a Windows Phone from Nokia, as Drive and Transit are two apps that could very well be worth the price of admission. Nokia Drive provides free, voice-guided, turn-by-turn directions, but as a unique twist, it's also capable of storing maps locally on the handset -- nothing short of a godsend for times when you navigate outside of mobile data coverage. Not only does this extend to maps for all 50 states, but you can also download maps from most countries across six continents. Nokia Drive also alerts users when they're speeding, and offers the ability to avoid potential nuisances such as toll roads, ferries, tunnels and unpaved roads. We used the app for a quick test drive and came away with the same impression of our full review: it's quick, competent and capable of replacing a dedicated GPS navigation unit. Nokia Transit does only one thing, but it does it really well. The app serves to guide users through their commutes and journeys with public transit, and it fills a much-needed void on Windows Phone. The app is easy to use, and thanks to its step-by-step maps and guidance, transfers are a breeze. Another nice perk: you can pin your most commonly used destinations to the home screen. Another fantastic app is Nokia Music, which combines a store, a service known as Mix Radio and concert listings into a single hub. It's worth pointing out that you'll also find the Xbox Music Store on the Lumia 810, which is part of the Windows Phone Store. Within Nokia Music, you'll typically find songs that sell between $0.99 and $1.29. Mix Radio is without a doubt the standout feature, however, which is similar to Pandora, but it turns things up to 11 by eschewing the ads and allowing users to download tracks for offline listening. The concert listings is certainly a welcome bonus, and as a nice touch, you'll often find links to purchase tickets from your phone. Other apps from Nokia include ESPN and Transfer My Data. The latter may be handy for new users, which seeks to import data from other phones via Bluetooth. If you're not a fan of any particular Nokia app, you'll be happy to know that you can uninstall anything you don't want. The same applies to apps that T-Mobile has loaded onto the Lumia 810, which includes 411 & More, CallerTunes, Slacker Radio and T-Mobile TV. You'll also find an app entry for Zynga Games, which merely serves as a shortcut to download the ad-free versions of Draw Something and Words with Friends. The Nokia Lumia 810 is an undoubtedly solid smartphone, but its ultimate undoing is the Lumia 920, a better device that costs less money. If you're unwilling to jump ship from T-Mobile, Nokia's custom software also throws a wrench in the equation, because you'll need to choose between superior hardware that does less (HTC 8X), or a relatively inferior smartphone that does more (Lumia 810). Alternatively, you could also wait for the Lumia 920 to break free of its six-month AT&T exclusivity. Or you could import the Canadian version, which just so happens to support T-Mobile's HSPA+ bands. So long as you're aware of the alternatives, we have no qualms recommending the Lumia 810. If you're wanting to snag the phone right away, however, you should prepare to swallow a bitter pill, because we don't expect its $150 price tag to last far beyond the holiday season.